Another print of what is historically the most famous tomb in the cemetery, c. 19th century. . .
and from 2006. . . PRIOR to the revolution, the French, like most other European nations, were in the practice of depositing their dead in churches and cemeteries within the most populous towns, in compliance with those precepts of evangelical doctrine which recommend us unceasingly to reflect on death; and hence originated a custom which cannot but be attended with most pernicious consequences to health, when we reflect that the decomposition of human bodies is productive of putrid exhalations, and consequently pregnant with the causes of contagious disorders. It is indeed surprising that some regulations have not hitherto been adopted in England regarding the interment of the dead, from the example of other countries. In the year 1795, a decree was passed by the National Assembly, to prevent burying in churches, or in church-yards, within the city of Paris. Since which period, there have been three places selected in its immediate neighbourhood for that purpose - Montmartre, called" Le Champ du Repos" - Vaugirard, and Pere La Chaise. 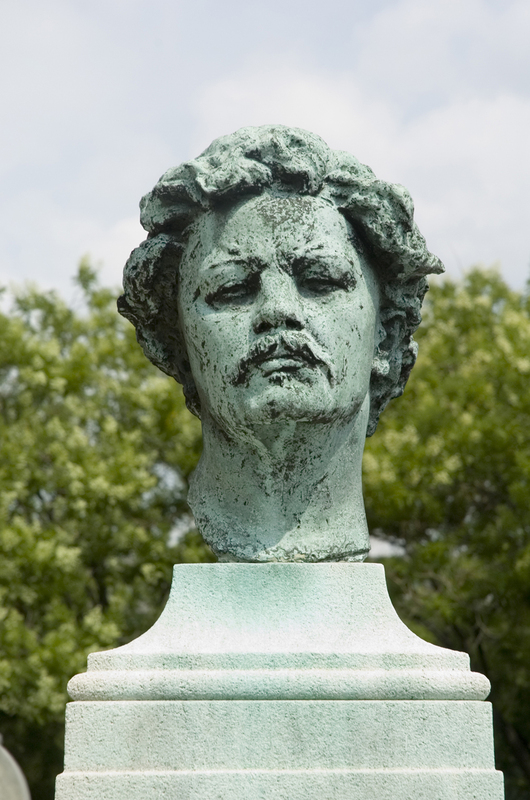 Quitting the Boulevards, at the extremity of the Boulevards Neufs, eastward of the city, and passing through the Barrière d’Aulnay, I arrived at the Pere La Chaise. At the entrance, through large folding gates, is a spacious court-yard, having at one angle the dwelling of the Concierge, or Keeper. The enclosure contains one hundred and twenty acres, on a gently rising ground, in the centre of which stands the ancient mansion constructed by Louis XIV. for his confessor, Père la Chaise, the celebrated Jesuit, who, with Madame de Maintenon, governed France. Rising above the thousands of tombs which surround it, it displays itself a wrecked and mouldering monument of ancient splendour, and the mutability of human affairs! This spot became afterwards a place of public promenade and great resort, from the beauty of its position overlooking all Paris; and though so often the scene of festivity and pleasure, now presents to the eye of the beholder a mournfully interesting sight of tombs and sarcophagi, intermixed with various fruit trees, cypress groves, the choicest flowers, and rarest shrubs. From the rising ground, above the building of Pere La Chaise, a most delightful view displays itself. The City of Paris appears to stand in the centre of a vast amphitheatre. The heights of Belleville, Montmartre, and Ménilmontant, in the west. To the east, the beautiful plain of Saint-Mande, Montreuil, and Vincennes, with the lofty towers of its fortress. - The fertile banks of the river Marne, are on the North, and in the South, the horizon encircles Bicetre and Meudon. 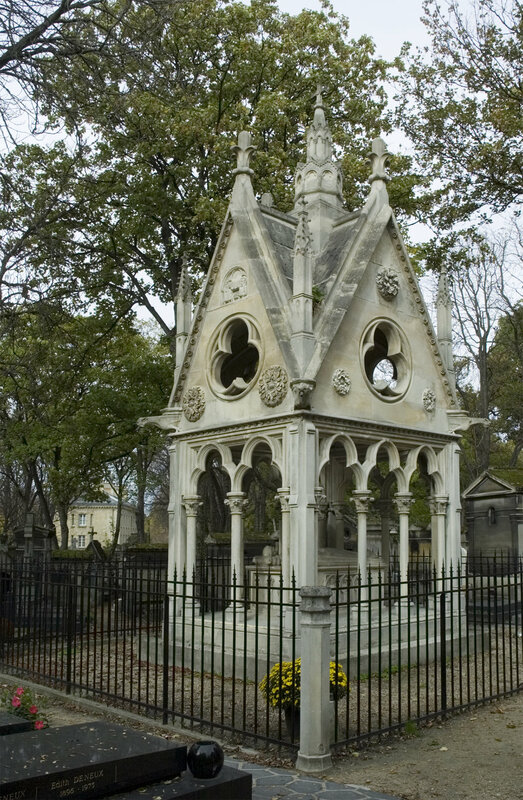 The various tombs are placed without order or regularity: they are mostly enclosed with trellis work of wood, sometimes by iron railing; and consist of a small marble column, a pyramid, a sarcophagus, or a single slab, just as may have suited the fancy or the taste of the friends of the departed. Some surrounded with cypress, some with roses, myrtles, and the choicest exotics: others with evergreens, and not unfrequently a single weeping willow, with the addition of a rose tree! This intermixture of the sweetest scented flowers and fruit trees, in a burying ground, among the finest pieces of sculptured marble, with evergreens growing over them, in the form of arbours, and furnished with seats, cannot fail to produce in the mind of the person who views it for the first time, peculiar and uncommon feelings of domestic melancholy, mingled with pleasing tenderness. Who could be otherwise than powerfully affected, as I was, by the first objects that presented themselves to me on entering the place? -- A mother and her two sons, kneeling in pious devotion at the foot of the husband's and the father's grave! At a short distance, a female of elegant form, watering and dressing the earth around some plants at her lover's tomb! - not a day, and seldom an hour, passes, but some one is seen either weeping over the remains of a departed relative, or watching with pious solicitude the flowers that spring up around it. Among the many interesting objects that presented themselves at my first visit, was the tomb of Abelard and Helolse [D07], which had not long since been removed from the convent of the Augustins, where I had seen it in 1815. At a little distance, to the left of the former, was the burial place of Labedoyere [D16]. The fate of this brave and unfortunate officer is well known; his youth, and misled zeal, have procured him a sympathy which his fellow sufferer Marshal Ney [D29] did not find, and did not merit. In the centre of a square plot of ground enclosed with lattice work, is erected a wooden cross, painted black. Neither marble, nor stone, nor letters, indicate his name. Two pots of roses, and a tuft of violets, alone marked the spot, which is carefully weeded. There is something more affecting in all this simplicity, something, in my mind, that goes more directly home to the heart, than in the most splendid monument or the most studied eulogium. As we came suddenly up we saw two females clad in deep mourning, weeping over it; at each arm of the cross was suspended a garland of flowers; we were about to retire again immediately, from the fear of disturbing their melancholy devotions, when the concierge, with a brutality indescribable, rushed forward, and removing the garlands, threw them among the shrubs at a considerable distance. The friend who accompanied me, after searching, recovered one of the garlands, and with more gallantry perhaps than policy, immediately replaced it, and reproaching the keeper with his unmanly conduct, vowed vengeance if he dared to interrupt the ladies again, when bowing to them we retired. As we were about to quit the place some time after, we were arrested by two gendarmes, and it was not till after a detention of some hours, and a long discussion between the police officers who had been summoned to attend, and being threatened to be sent to the Conciergerie prison, that we were allowed to depart. The following words were engraved on a plain marble slab that covered the remains of Marshal Ney. The grave of the Marshal, as well as that of Labedoyere, when I again visited the spot, had been stripped of every thing, and the railing around them removed so as to prevent any one from discovering the place of their interment. The linden tree, intermixed with various evergreens, form an interesting and beautiful bouquet around it. Beyond this, to the right, are the tombs of Gretry the composer [D13], Fourcroy the great chemist [D11], Fontenelle [D27? ], Boileau, Racine, and of Mademoiselle Raucourt [D20], the celebrated actress, to whom the bigotry of the clergy refused burial in consecrated ground in 1815! a circumstance which gave rise to much clamour and dissatisfaction. It is surprising, that after such events as have been experienced in France, the folly of denying the right of consecrated ground to a comedian should have been persevered in, after the restoration of Louis XVllI! In 1814, when the Allies approached Paris, this height, like the others commanding the capital, was fortified, and occupied by the students of the Polytechnical School, who defended it with great gallantry. The walls were perforated with holes for the musketry: the marks are still visible where they have been since filled up. On the 30th of March, 1814, this position was vigorously attacked, with great slaughter on both sides: the assailants and the assailed fell in heaps, and it was not until the chief part of a Prussian corps, (that afterwards carried it by assault) had been annihilated, that the brave youths gave way. Nothing was wanting but opportunity. He honoured by his deeds. Active and bold in the execution of them. In doubtful enterprises, wise and prudent. And dead in his bed. He died the 28th October, 1805, aged 36.